Welcome to the Hirsch Online Store. All purpose cleaner/lubricant. Safe for all machine surfaces. Hook Wash blasts away dirt from your embroidery machine. 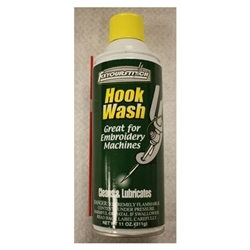 A mineral oil-based lubricant/light solvent mixture used for cleaning rotary hooks and other parts of embroidery machines. The goal of using Hook Wash is to enhance the performance of the embroidery process by reducing thread breakage and bird nesting. This is done by removing dirt, lint, dust, solvy, spray adhesive and other debris that can build up and cause a machine to be less efficient. Also, Hook Wash will displace water and leave a protective film of light lubricant on the parts.